We decided to head east for a change and explore Tyler and Lake Palestine. On the way though Tyler we had dinner at Mercados which was recommended by a couple different people, Good margarita and ok traditional Mexican fare. 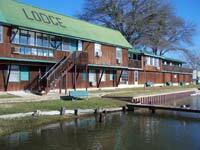 We spent Thursday and Friday night in one of the lodge rooms at Lake Palestine Campground and Lodge. 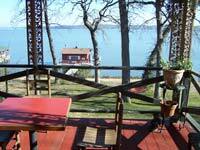 Lake Palestine Campground sits on 10 acres on a peninsula in a cove of Lake Palestine. They have RV sites, one tent site and a variety of lodge rooms. We had a room that overlooked the cove and was 10 feet from the water. 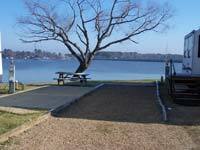 Lake Palestine Campground is a good spot to stay because it is centrally located for exploring Lake Palestine, an easy 10 minute drive to Tyler, or 15 minutes south to Palestine. Following a good breakfast in the Lake Palestine Campground cafe, we headed to Tyler to play "The Traveling Texas Tourist". The first stop was the Tyler visitors bureau to pick up all the standard tourist information and to make sure that we didn't miss any of the Tyler attractions and things to do. Right across the street from the visitors bureau is the Discovery Science Place. This is an excellent place to spent some time with your kids - they have three hands-on exhibit halls where kids are free to move around and explore, plus hands on learning centers, a subterranean display, and an interesting traveling exhibit from San Francisco. Kids from 5 to 12 should really enjoy a few hours here. After the museum we cruised by some of the beautiful and majestic historical homes dating back to the 1860's. We ended the day at Brookshire's World of Wildlife Museum and Country Store. 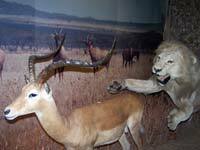 The museum has over 250 mounted examples of wildlife and a replica of a 1920's grocery store. Brookshire's is also a place that the kids will enjoy where they can get up close and personal with a mounted tiger and other animals! We were impressed with the number of attractions in Tyler, you can learn more about some of the other things to see and do in and around Tyler but visiting the Texas Outside Guide to Tyler which includes the Tyler Top Ten Things To See and Do. After all that tourist stuff, we were ready for a good dinner and some partying. We were a little disappointed, everyone that we talked to all day had a hard time thinking of a fun joint with live music. We called a couple only to find out that they have music during the summer only. We ended up at Old Grande Restaurant. This is a two level facility with a good restaurant, dance floor, and bar in a large upstairs room. Dinner was very good - try the steak with a sweet bourbon sauce. We enjoyed Old Grande because your dinner is served a few tables back from the dance floor which means you can eat a good meal, listen to the music, and watch the lively dancing crowd at the same time. A good three piece band was playing 70's to 90's music kept the dance floor full. Downstairs is a bar, dance floor, pool tables, a live band, and a lively crowd. Downstairs attracts a much younger crowd. This is a good place to eat, dance, socialize, or just listen to some music. Another good breakfast then off to check out Kiepersol Estates Vineyards, Winery, and B & B which is a 20 minutes south of Tyler. 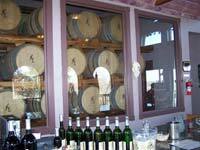 We chatted with the wine master and sampled some wine on their deck overlooking the vineyard and country side. Kiepersol also has a very nice five room B&B and an excellent restaurant and bar. The grounds are beautifully appointed and landscaped. You can take a horse drawn carriage ride through the property and vineyard. Saturday afternoon was spent on the links at Oak Hurst Golf Course just south of Tyler. This golf facility has two courses, Oak Hust and Peach Tree. Oak Hust is an outstanding golf course offering everything that we enjoy in a course - scenic beauty, rolling hills, very good condition, lots of water, good value, variety, and challenges. We rated it 8.2 stars - you can read our review by clicking here. Take a look at the Tyler Golf Map to find other good golf courses in, and nearby Tyler. The Peach Tree course next to Oak Hurst looks boring with holes that are side by side, straight, and flat. After asking everyone we talked to where to eat and party (got mostly blank stares and few good answers), the winning recommendation for dinner was Coffee Landing Restaurant (903 876-4923) in Coffee on Lake Palestine. Coffee Landing is known for their seafood buffet for lunch and dinner, but they also have steaks, sandwiches, and more. We had the seafood buffet which was good and included: two types of fish, crab, salads, desserts, lots of shrimp, crawfish, stuffed crab, veggies, deserts, and much more. We waddled out of Coffee Landing and headed for the closest, and only recommended nightspot for some cold brewskis and live music. Half Moon Bar & Grill (Gresham) can best be described as a small, local hole-in-the-wall type bar with a fun and friendly crowd, pool tables, video games, TVs, and some pretty good live music. We spent Saturday night at the Duck Inn B&B. 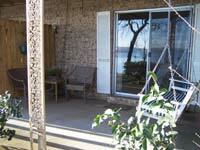 This is a nice house right on the lake with four cozy rooms for rent. Each of the rooms have an outside entrance, private bathroom, excellent view of the lake, private patio, and some rooms have hot tubs. 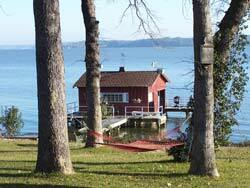 Duck Inn also has a boat dock and hammock for your enjoyment. The owner, Ann is a great lady, perfect host, and excellent chief. Duck Inn is also a great place to stay to relax or to explore the surrounding area. 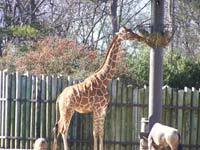 Caldwell Zoo also has a gift shop; casual Cafe offering diners views of zebras, lions,giraffes; a walk through aviary; and a children's petting zoo. 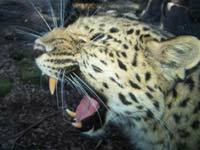 Caldwell Zoo is well worth the price of admission (2007 prices ranged from $4 to $7.50). Since wondering around the zoo didn't wear off enough fat calories from the Coffee Landing buffet plus all the beer from the Half Moon Bar, we decided to hit the bike trails at Tyler State for some more exercise. Tyler State Park, which is 7 miles north of downtown Tyler, is 985 acres of natural beauty around a very pretty 64 acre lake. Tyler State Park has excellent RV and tent campsites, canoe rentals, screened shelters, and 16 miles of trails. 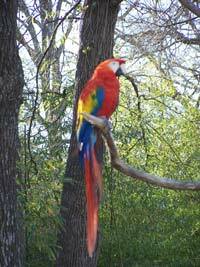 These popular trails are some of the best in Texas as they meander up and down the hills cutting through the Pinewoods, and around the clear spring-fed lake. The trials are fairly hilly and offer a full range of loops from family appropriate to expert trials. Some of the terrain can be steep and technically very challenging. 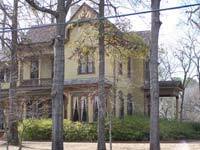 You can read our review of Tyler State Park by clicking here. Enjoy, this is a great park! After a few hours on the trails, it was time to head back to the big D after a very fun weekend.